A Beach and an Adventure: Button It! I just finished editing the Winter issue of the Astrolabe. A week late. If you remember, that was last weekend's project. And if you are wondering why I have not written a blog this week, then you need to remember what last weekend's project was again. The next issue of the Astrolabe will feature an article on the British regimental buttons found during the Ft. George archaeological survey. And though I try and not talk about museum work on this blog, this week we have been researching the regimental buttons from the collection. Every regiment of the British Royal army had their own pewter buttons, which were worn on the "redcoat." We found many buttons on Ft. George, but eleven of them represented a specific British regiment. 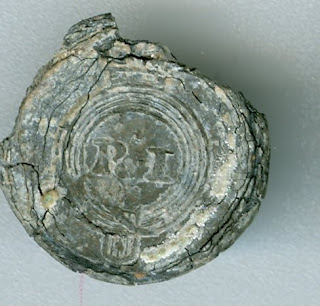 One particular button is marked in the center with "R.I." We spent four days this week searching on the internet to find a similar button that would indicate what regiment this button belonged to. This search held up the Astrolabe for most of the week, as determining this button became very important. Looking intensely through the collection I realized we had four of them (two of them were very deteriorated and at first they were not recognized). The only thing close to R.I. as far British regiments go was the Royal Irish, the 18th of Foot, but this did not make sense because nearly every regimental button has numbers on them. After searching through hundreds of websites, Tiffany finally found a button which was for sale by a private collector. This button referenced both the RI and the 18. The smoking gun. The 18th of Foot, the Royal Irish Regiment, must have been on garrison duty at Ft. St. George while they were stationed in Jamaica sometime between 1805-1817. This pushes the dates of our fort occupation a little past the 1804 date we have been working with and provides a new avenue of research within a regiment that we did know was here. I thought this was about the coolest thing this week. Hopefully this was not too boring. Would you have rather heard about the three stingrays we saw snorkeling on the wall yesterday? Now that has become boring. I am ready to do research again for a while.